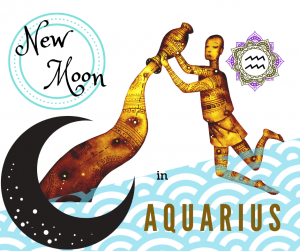 There will be a New Moon at 15°45’ of Aquarius, a fixed, Air sign on the 4th of February, this is the fifth in a series of seven New Moons in a row at 15° of the relative monthly sign. Saturn, the traditional ruler of Aquarius and dispositor of the lunation is at the midway point of Capricorn and sextile Neptune…it’s easier now to ground those fantasies and make them real. Uranus, the modern ruler of Aquarius is at the end of its stay in Aries and Mars is swiftly approaching a conjunction to it…things will happen in sudden and unexpected ways…try not to be too surprised or upset if you’re world turns topsy-turvy. The New Moon itself is conjunct Mercury indicating that not only our body and soul lend themselves to the collective but our thoughts remain detached and are able to better cope with happenings should they slip outside our comfort zone. New Moons are excellent moments to do a reality check, asking ourselves where we are at the present moment in time and where we would like to go, particularly regarding the matters of the house where the New Moon falls in your chart and thus set our relative intentions for the month ahead. Whilst this New Moon might be used to release emotional attachments that restrict our freedom in some way it also reminds us that we are not alone and that by involving ourselves with others we can change our world. Another point to consider during this Moon phase might be how to strengthen your network of friends (11th house) as you reflect on your own unique talents (5th house). Raven Kaldera in his book “Moon Phase Astrology” calls this the Father’s Son Moon. He suggests that all New Moon archetypes are children and youths and, as such, that there is a youthful quality to their emotional natures. Thus the Father’s Son represents the Golden Boy, being the father’s heir and hope. On this New Moon, Kaldera suggests that we examine our feelings about our own personal father (or mother if she was career-minded or externally-orientated instead of concentrating on the home). Or, we could look at our attitudes concerning the “Fathers of Society” and how “their” rules and regulations have or have not any value for us at this present time. However, if we are at unease with these guidelines, we might ask ourselves whether we have had or have the courage to openly disclaim them or if it pays us in some way (and which way) to follow them blindly. The Sabian symbol for 16° Aquarius: “A big business man at his desk.” Indicating the ability to organise the many aspects of an enterprise involving a large group of human beings. What are your intentions for this New Moon?